Turkish Internet users woke up on 24 October to find that access to Blogger, the popular blog-hosting site owned by Google, had been blocked by a court order, because of illegal material (streams of football games) found on a handful of blogs. The ban on Blogger — provisionally lifted after five days — came without warning, but few were surprised by it. In the last two years, Turkey has become increasingly involved in controlling what its citizens can access online. So far in the last year, access to more than 850 websites has been blocked by the Turkish state, either through court order or government action. YouTube, the popular video sharing site, has been banned since last May, after amateurish clips mocking Mustafa Kemal Ataturk, modern Turkey’s founder, were posted on it. WordPress, another major blog-hosting site, was blocked for more than a year and the website of Oxford evolutionist Richard Dawkins is currently off limits to Turkish Internet users. As the number of websites being blocked by Turkey’s courts and government rise, so do concerns about Internet censorship in the country and Ankara’s already troubled record on freedom of speech. ‘The current Turkish law on controlling Internet content, through its procedural and substantive deficiencies, is designed to censor and silence political speech,’ says a report set to be published next month by Cyber-Rights.Org, a British Internet civil liberties organisation. A law passed by the Turkish parliament last May, intended to prevent access to primarily pornographic and obscene web content, has given the state broad powers to block websites. The newly created Telecommunications Directorate, a government office that monitors the Internet, is allowed to shut down websites without even a court order. The agency has been behind 612 of the approximately 850 bans this year. One particularly troubling aspect of the law’s flawed implementation has been the ability of individuals to petition courts to ban a website, usually claiming they are being slandered by material on the site. 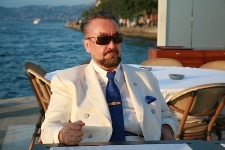 The case of Adnan Oktar, also known as Harun Yahya, leader of a Turkey-based Islamic creationist group is telling: with the aid of skilled lawyers and compliant provincial judges, Oktar and his group have been behind the bans on Richard Dawkins’ website and WordPress and were even able to get temporary blocks placed on the websites of Vatan, one of Turkey’s largest newspapers, and Egitim Sen, the Union of Turkish Educators. Oktar’s deceptively named Scientific Research Foundation (Bilim Arastirma Vakfi (BAV) in Turkish), is a remarkably successful creationist group that has, over the last 15 years, managed to make itself a household name in Turkey with travelling fossil shows that claims to disprove the theory of evolution, and a popular series of books. The group — whose funding remains a source of great mystery — says it is distributing its creationist books in 80 countries and in 59 different languages, including Arabic, Chinese, Swahili and Polish. Two years ago, BAV blanketed several European countries and the US with its glossy Atlas of Creation, an 800-page tome weighing more than 12 pounds (six kilos), sending it to scientists, journalists and schoolteachers. Since founding the BAV in 1990, Oktar — a 52-year-old former interior design student — has been responsible for the publication of over 250 books, with titles such as The Dark Spell of Darwinism and Why Darwinism is Incompatible with the Koran, all written under the name Harun Yahya. Oktar’s brand of creationism is not only religious, but also political and even messianic, seeing most of the world’s ills — terrorism and fascism among them — as stemming from Darwin’s theory of evolution. Otkar has opened up yet another front in Turkey’s religion and culture wars, and now seems to have also started a battle for what Turks can read online, a battle he is winning thanks to Turkish legislators’ attitude towards the Internet. Critics of Turkey’s Internet laws have been dismayed by the state’s heavy-handed approach, which allows for entire websites and blog platforms to be blocked because of a small number of items deemed offensive or illegal. Turkey is not alone in blocking content, but observers say it has taken a very expansive and problematic approach, giving courts all over the nation the power to shut down web access for the nation’s 70 million people, with little explanation or public oversight. There is also concern among officials in the European Union, which Turkey hopes to join. The EU has previously been critical of Turkey’s record on freedom of expression issues, particularly in regard to its prosecution of writers and journalists under Article 301, a vague law that punishes those who insult the state and its institutions. EU officials in Turkey say their concerns will be expressed in an upcoming report detailing the progress of Turkey’s membership bid, due to be released in November. ‘It is a very restrictive law and the implementation has been very problematic,’ says one EU official based in Ankara.